The Prespes Agreement was ratified by the Greek parliament on Thursday, following a 3 day heated discussion, with a majority of 153 votes, with 146 voting against and one deputy abstaining with a vote of ‘present’. The win, which came on the anniversary of leftist SYRIZA’s rise to power four years ago, had been widely anticipated as most MPs had made their voting intentions known several days earlier. In addition to SYRIZA’s 145 MPs, Tsipras garnered the support of independents Elena Kountoura, Katerina Papacosta, both ministers, and Thanasis Papachristopoulos of former junior coalition partner Independent Greeks (ANEL), centrist Potami MPs Stavros Theodorakis, Spyros Lykoudis and Giorgos Mavrotas, as well as Spyros Danellis, a former Potami MP who is now independent, and Thanasis Theocharopoulos, formerly with the centrist Movement for Change. “Today is a historic day for Greece,” Prime Minister Alexis Tsipras said in statements made in the entrance of parliament on Friday, after the vote for the ratification of the Prespes Agreement to end the FYROM name dispute. “The result of today’s vote has no winners and losers,” the prime minister said, addressing all Greeks. The day was historic for Greece because it ended a major outstanding issue that had burdened the country’s foreign policy, the prime minister said. “We are protecting an important part of our history, the heritage of ancient Greek Macedonia,” Tsipras noted. “At the same time, it is a historic day for the Balkans with their long history of conflicts, disputes and nationalist hatred. We are turning a page and giving space to peace, cooperation, friendship, solidarity and mutual understanding,” Tsipras said. “I am certain that the next generations and both peoples will be grateful to them, because today they laid the foundations for a future of peaceful coexistence, solidarity and cooperation,” he said. “I especially want to address those that even today have objections, which we respect, and criticisms. We respect them. They can be certain that very soon they will see great benefits for the country from this historic step forward,” he said. “I believe that it is an important step forward, a historic step, and I want to thank all MPs…. including those that, despite their disagreements, contributed to a civilised political atmosphere during the four days of the in-depth and exhaustive discussion,” Tsipras added. Asked whether he had been contacted by Prime Minister Zoran Zaev, Tsipras said that Zaev had telephoned to congratulate him, as other leaders had done. 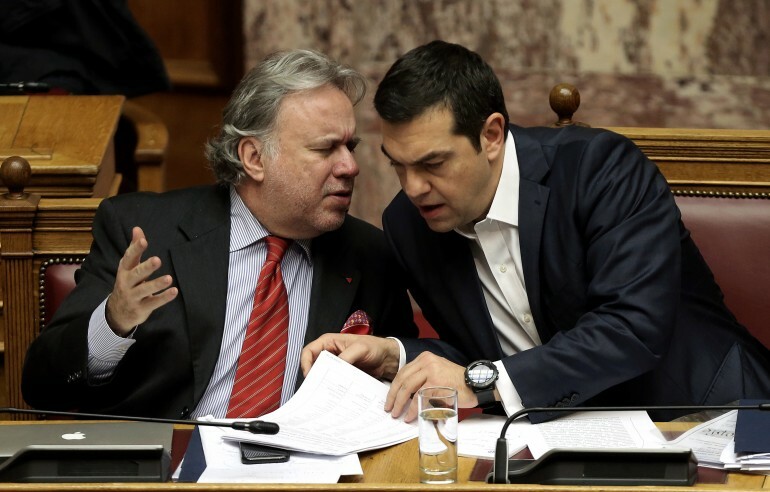 Hailing the ratification of the Prespes Agreement in the Hellenic Parliament on Friday, former Greek foreign minister Nikos Kotzias, who had negotiated the agreement, said that the “policy of peace triumphed” in a message on Twitter. “The policy of peace triumphed. It is now urgent to adopt, along with our friends in North Macedonia, all those positive measures foreseen in the Prespa Agreement, our common future. Zoran and Nikola, History is a school, not a prison.Together, we stood on the right side of History,” Kotzias said. “Today is difficult, a sad day for Greece,” main opposition New Democracy (ND) leader Kyriakos Mitsotakis said on Friday after the ratification of the Prespes Agreement. “The government, with an opportunist majority, voted for the harmful Prespes Agreement. Its ratification means the official recognition of the Macedonian language and identity for the residents of [Greece’s northern neighbour] for the first time by a Greek government, so the 10-year national line is abandoned. Tsipras said ‘yes’ where all his predecessors said ‘no’. Only he knows the reasons,” Mitsotakis said. The Prespes Agreement will create more problems thanit resolves, New Democracy leader Kyriakos Mitsotakis said on Friday at an Economist conference in Athens, but added he would never accuse anyone of being a traitor for voting for it. “I would never call anyone a ‘traitor’ for supporting the Agreement, nor would I support the violence I saw used the past few days,” Mitsotakis said, adding that he had warned that Friday’s vote in parliament was critical because “once a treaty is ratified, there’s very little one can do to change it.” He said however that he will work to minimise its damage to Greece. The main opposition leader also accused the government of “operating on two ad hoc parliamentary majorities, one that gave (PM Alexis) Tsipras a vote of confidence and one that voted for the Prespes Agreement.” As “this creates instability and makes the government vulnerable,” the country should go to national elections, he said. The elections are likely to be held in May, before the government’s term ends in October, Mitsotakis maintained. Asked to name his own three priorities, the ND leader named the economy, education and citizen safety. “We want the reduction of taxes, rationalization of public expenditures and development through the attraction of foreign investments, and the creation of new jobs,” he said. “We need a new contract with the business sector, and we can do this,” he added. The Greek parliament “made a decision that serves the interests of the Greek people and enforces security in the region,” Potami leader Stavros Theodorakis said following the ratification of the Prespes Agreement on Friday. The ratification of the Prespes Agreement by the Greek Parliament prompted congratulations from European, US and NATO officials who had worked for a resolution to the long-standing dispute. In a written statement, U.S. Secretary of State Mike Pompeo welcomed on behalf of the United States the decision by Greece’s Parliament to ratify the Prespa Agreement. “Congratulations to the leaders of Greece @Tsipras_EU and Macedonia @Zoran_Zaev on ratification of the Prespa Agreement. The United States supports this remarkable achievement that will promote stability and prosperity in the Balkans,” Bolton said. In a statement attributable to the Spokesman for the Secretary-General, Antonio Guterres congratulates the Hellenic Republic on the ratification of the Prespa Agreement by its Parliament. “This follows the important steps undertaken recently by the Parliament of the former Yugoslav Republic of Macedonia towards the implementation of this landmark Agreement, negotiated under United Nations auspices, through the Secretary-General’s Personal Envoy, Mr. Matthew Nimetz. The Secretary-General commends the leaderships of both countries. The implementation of the Agreement will strengthen peace and security in the region and provide a fresh impetus to reconciliation efforts in Europe and beyond. UN mediator Matthew Nimetz, in a written statement issued by the office of the UN representative, also welcomed the ratification of the Prespes Agreement. “We warmly welcome the next crucial step in the ratification of the Prespa agreement, taken with today’s vote by the Hellenic Parliament. “From the very beginning, the European Union has strongly supported the historic agreement signed by Prime Ministers Tsipras and Zaev, following negotiations under the auspices of the UN. It took political courage, leadership and responsibility on all sides to resolve one of the most entrenched disputes in the region. Both countries have seized this unique opportunity which sets an example of reconciliation for Europe as a whole and will give a further boost to the European perspective of the region. European Council president Donald Tusk posted a message of congratulations for the ratification of the Prespes Agreement by the Greek parliament on his personal Twitter account on Friday. “An important step was made for the political and economic stability of Greece, the region and Europe,” Commissioner for Economic and Financial Affairs Pierre Moscovici tweeted. British Prime Minister Theresa May congratulated the Greek parliament and the government of Alexis Tsipras for the Prespes Agreement, calling the ratification vote on Friday a “historic moment for Greece”. “Historic moment for Greece and the wider region with positive vote for Prespes Agreement. 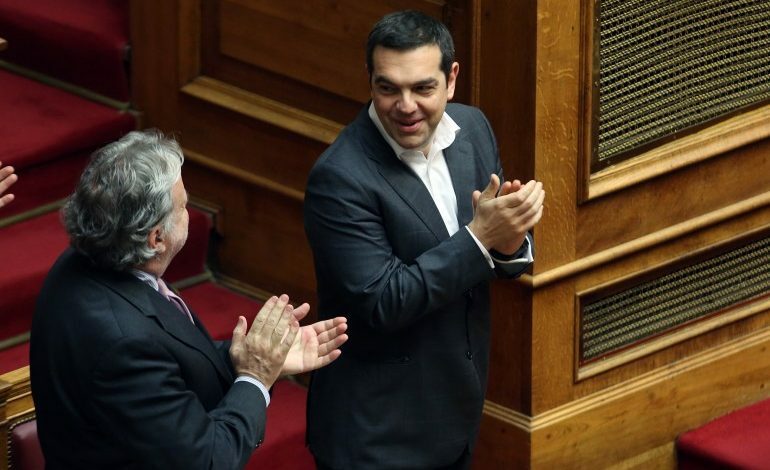 Congratulations to Greece’s parliament and government @atsipras,” she said on Twitter. In a statement, Foreign Secretary Jeremy Hunt said the dispute had created tensions for nearly three decades, and had been an obstacle to FYROM’s membership of NATO and the EU. Maas said the democratic decision to ratify the Agreement at both countries’ parliaments opened the way for FYROM’s NATO and EU membership, which he said Germany will support. He also acknowledged the process cost a lot of “sweat and some tears,” and he lauded the two countries’ prime ministers for their immense efforts to resolve the name issue. Former Yugoslav Republic of Macedonia (FYROM) Prime Minister Zoran Zaev, in a twitter message posted on Friday, hailed as a “historic victory” the ratification by the Greek parliament of the Prespes Agreement, which will change the name of his country to North Macedonia and bring a long-standing diplomatic dispute between the two countries to a close. “Congratulations my friend @tsipras_eu,” Zaev wrote, addressing Alexis Tsipras, “together with our peoples we reached a historic victory. Long live the Prespa Agreement! For eternal peace and progress of the Balkans and in Europe!” Zaev wrote. The government of Former Yugoslav Republic of Macedonia (FYROM) issued a statement on Friday hailing the ratification of the Prespes Agreement by the Greek parliament and congratulating the people of the two countries. “The government congratulates the citizens of both countries, for the peace, progress and development that this agreement brings and encourages them to intensify their cooperation, connections and friendship. By reaching the Macedonian-Greek solution, the Balkans, Europe and the world have a new model for building friendship and cooperation between peoples and countries. The government is grateful to all citizens, political and other societal actors that have supported the agreement and provided uplifting to the historical solutions built in it”. Courage and hope defeated fear. The future is there. As Nikos often says, history should be a teacher, not a prison. I am so proud of what we did. Long live our friendship and the friendship between our nations! 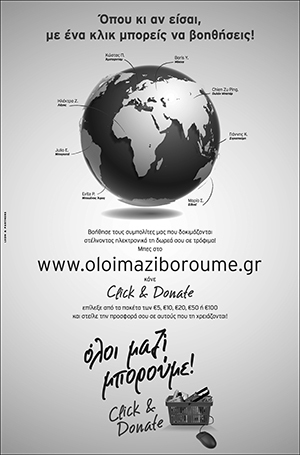 Long live visionary patriotism!,” Dimitrov wrote. Former Yugoslav Republic of Macedonia (FYROM) Vice President Bujar Osmani congratulated the Greek parliament on the ratification of the Prespes Agreement, on a message posted on his Twitter account of Friday. “Congrats to the Greek parliament – the Prespa Agreement is now fully implemented,” Osmani wrote, stressing that the friendship between Greece and FYROM is now irreversible. Albania and Kosovo have hailed the vote of the Greek parliament ratifying the Prespes name deal, saying it’s a great contribution to regional stability.